Most everyone has questions about Heaven. Am I going to Heaven, who will I meet there, what will I do there, these and many more questions are answered in this pamphlet. A colorful well illustrated pamphlet that answers a lot of question about Heaven. The answers come from the Bible, the only source of knowledge about Heaven that we have. Some answers are direct and some are indirect, but out of 600 verses about Heaven, we get a good picture of what Heaven is. 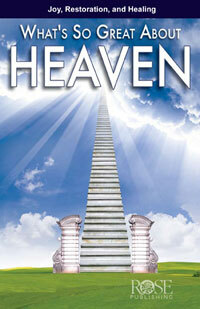 The pamphlet will take you through the information and give a clear picture of what to expect in Heaven. Using charts to compare what will continue and what will end in Heaven, the different of natural bodies and spiritual bodies. These are just a few of the questions answered. The most important question will be answered, How do I know if I am going to Heaven? A great reference sheet for Bible studies and family discussions to get a new understanding of Heaven. I am sure this pamphlet will give you the answers to questions that you may have asked and will help answer question of others.